Manually recording time/temperature on graph paper was rendered obsolete when RoastLog was introduced a few years back. Now, in that same vein, tracking the progress of a roast has gotten a lot easier and doesn’t require being tethered to a laptop or computer. As any large-scale roaster will tell you, attending to a laptop isn’t always practical in a production environment – yet we know that keeping you connected with your roasting is always a priority. We took this as a challenge to develop a better system for making sensory observations and data recording. Our solution: A brand new iPad version of RoastLogger that uses Bluetooth LE (low energy), also known as Bluetooth 4.0, technology to communicate with the RoastLog Data Bridge. 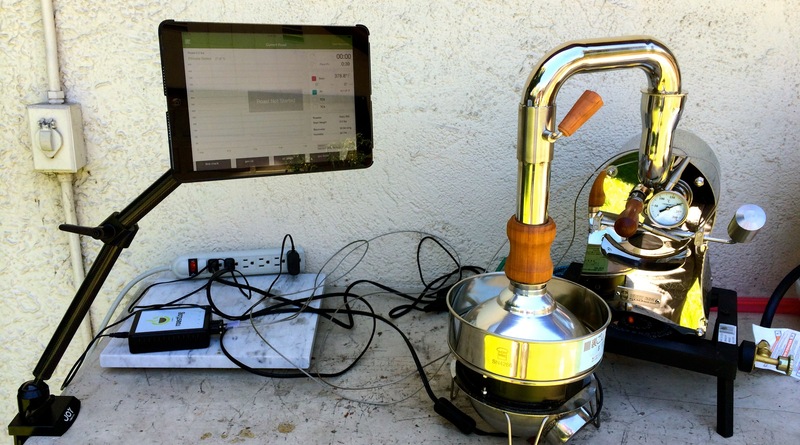 Roasting coffee with the wireless Data Bridge. Note there are no wires connected to the iPad. From a software perspective, developing a brand new iPad application gave us a chance to revisit over four years of lessons from our existing RoastLogger application. 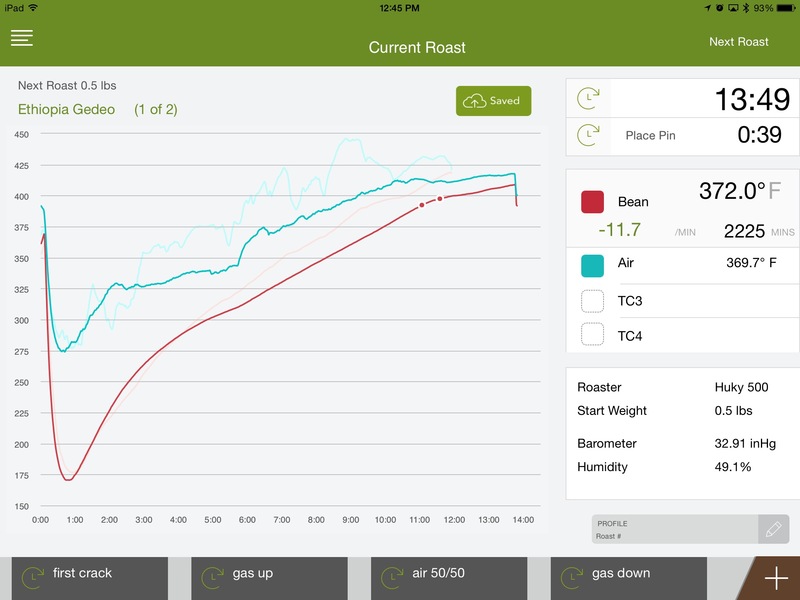 The new RoastLogger iPad app is our tool designed to make it easy and intuitive to explore and develop roast profiles. Doing away with a mouse and keyboard really helps productivity in an environment like roasting coffee. Users won’t need to make the clumsy context switch between a computer and roaster… logging actions are easy and a few simple taps away. The biggest challenge for us was cramming all this new functionality into the product while maintaining a simple interface. In the end, it took a little longer than we anticipated, but I think we’ve succeeded on improving our popular RoastLogger program. Developing a brand new circuit board to support wireless connectivity gave us a chance to add even more enhancements. This new platform adds barometric pressure and humidity sensors, giving roasters the chance to automatically record two completely new data points. iPad RoastLogger screenshot at the end of a roast. Note the humidity and barometric pressure readings in the lower right corner. As with any controlled process, roasters need to consider the impact of as many variables as possible. Environmental factors can and do affect the roast. In some parts of the world this includes seasonal climate changes and local weather conditions. RoastLog now tracks these conditions at the time of the roast for comparison with historical and future roasts. In addition to the displayed value for heating rate (sometimes referred to as rate-of-rise), we’ve added this into our charts in the form of a plot. This metric is commonly used to get insight into a roast in progress. Super valuable for avoiding stalled roasts and insightful for making comparisons between different roasted batches. A unique way from RoastLog of representing the amount of energy inputted into a given roast. It’s also handy for understanding milestone events by adding a dimension beyond time & temperature, e.g, the roast energy from drop until first crack or between the beginning/end of first crack. This timer was developed to give users the ability to monitor the amount of time spent in arguably the most import phase of the roast, the roast development phase. As a cloud-based solution, RoastLog continues to provide access to all of your roasting data anywhere you can connect to the internet. Growing interest in roast profiling fueled the adoption of RoastLog when it launched in 2011. We’re excited to continue to provide innovative solutions to meet the requests of our users. The roasting community has spoken – and the consensus seems to be that roast profiling is helping to improve the quality and consistency of roasted coffee available today. The iPad app can be found in the App Store. Feel free to contact us for more details on how to get the new wireless data bridge. Thanks for your continued support! ← What are You Drinking?